ll of our custom framing services are offered through The Sporting Gallery, in Middleburg, Virginia. We have access to the Gallery's custom framing studio and all their restoration services. Staff members have over 60 years combined experience in this field and can provide the finest and most creative custom framing you'll find anywhere. In addition, they are well trained in the art of conservation framing and can offer the best advice when it comes to how to properly display and light your artwork and collectibles. Whether you need an antique frame restored or repaired, or you are searching for an antique replica frame, these are just a few of the fine framing services offered. 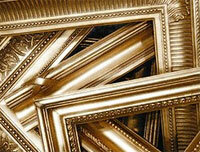 We stock a wide selection of picture frame molding and matting choices and only use only 100% conservation materials. We offer expert advice concerning the conservation and restoration of oil paintings, works on paper and antique frames. We have been working with the same professional conservators for over 30 years. In addition, we can offer professional advice about the care and maintenance of all your artwork, as well as assistance with placement and proper lighting.